If you've been touched by chronic disease such as Cancer, Heart Disease, Autism or Stroke, this website may contain the most important information you will ever learn! The videos here will educate you regarding the oxidative process and how oxidation is causing chronic disease. The Center for Advanced Medicine and Clinical Research in Cornelius, NC, addresses the needs of patients suffering from Chronic Disease, Treatment Failures, Difficult to Diagnose conditions, Autism, Cancer, Neurodegenerative Diseas, Heavy Metal Toxicity and more. Website for Dr. Buttar's Best Selling Book, The 9 Steps to Keep the Doctor Away, Simple Actions to Shift Your Body and Mind to Optimum Health for Greater Longevity. If you can take a few simple actions, this book will quickly give you a whole new life! This website contains the truth about Dr. Rashid A. Buttar and his struggles with the North Carolina Medical Board. This website contains detailed documents, legal notices and video updates from Dr. Buttar himself. Listen or download past episodes in MP3 format. This website contains information about Advanced Medicine and the International Association for a Disease Free World. If you are suffering from ANY chronic disease, then you owe it to yourself to Know Your Medical Options. These DVD's were created for the express purpose of what the title indicates - giving the viewer options to their medical dilemmas that they did not previously realize even existed. 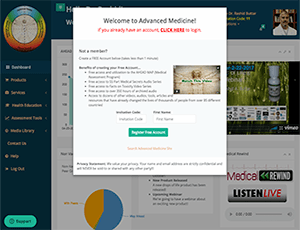 Website for Trans-D Tropin, a revolutionary, clinically-proven aging and longevity solution used and recommended by thousands of top doctors around the world. Benefits include enhanced physical performance, faster healing and recovery, sustained natural energy and more! On this website, you will find information about how to transform your life and impact everyone around you to a level that you have previously only dreamed of - not only a more SUCCESSFUL LIFE... but a simpler, fun, worthwhile, profitable, freeing type of SUCCESSFUL LIFE! Dr. Buttar's Vimeo Channels. These include video updates from Dr. Buttar, important information, as well as patient self-assessments and success stories. Every Monday the Robert Scott Bell Show will feature Advanced Medicine Mondays - Medical Rewind with Dr. Rashid A. Buttar, focusing especially on medical and prevention issues relevant to everyone and will be able to take live questions on the radio. The AMESPA Children's Research and Treatment Foundation is a non-profit organization founded by Dr. Buttar in 2007. It's sole purpose is to help with research and provide treatment for childhood diseases, such as autism and cancer, traditionally considered to have no known cause or cure. Upcoming retreats and seminars with Dr. Rashid A. Buttar. Dr. Buttar's YouTube Channel. These include video updates from Dr. Buttar, important information, as well as patient self-assessments and success stories. Each weekday from 12-2 PM EST, Robert Scott Bell empowers his listeners with healing principals that can aid in physical, emotional, mental, spiritual, economic and yes even political healing! You’ll be amazed by the amount of information about healing that is kept secret from you and what you can do to learn more about it! 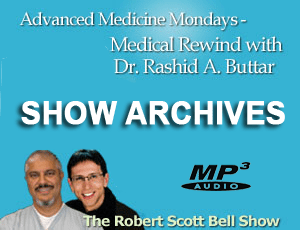 Every Monday the Robert Scott Bell Show will feature Advanced Medicine Mondays – Medical Rewind with Dr. Rashid A. Buttar, focusing especially on medical and prevention issues relevant to everyone and will be able to take live questions on the radio. 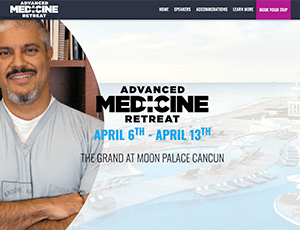 Click Here to read the announcement about Advanced Medicine Monday – Medical Rewind with Dr. Rashid A. Buttar on the Robert Scott Bell Show blog. Click Here to watch the video announcing the launch of the Robert Scott Bell show on the Natural News Network. 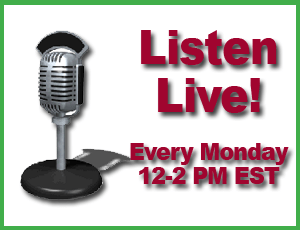 Dr. Rashid Buttar and Robert Scott Bell host a twice weekly podcast. To listen or subscribe Click Here.